Kick off your visit on the 18th (Sun): enjoy the sand and surf at Playa Punta Soldado Beach, then kick back and relax at Zoni Beach, and then kick back and relax at Tamarindo Beach. Get ready for a full day of sightseeing on the 19th (Mon): enjoy the sea views from Culebrita Lighthouse, kick back and relax at Carlos Rosario Beach, and then head off the coast to Culebrita Island. To find maps, ratings, other places to visit, and tourist information, you can read our Culebra vacation planner. Richmond, USA to Culebra is an approximately 12.5-hour flight. Due to the time zone difference, you'll lose 1 hour traveling from Richmond to Culebra. Traveling from Richmond in June, expect a bit warmer with lows of 79°F in Culebra. Cap off your sightseeing on the 20th (Tue) early enough to travel to Isla de Vieques. Get outdoors at Secret Beach and Caracas Beach. Discover out-of-the-way places like Blue Beach and Mosquito Pier. The adventure continues: explore the activities along Sun Bay, contemplate the long history of Puerto Ferro Lighthouse, and kick back and relax at Media Luna Beach. To find other places to visit, maps, more things to do, and other tourist information, refer to the Isla de Vieques trip planner. Isla de Vieques is very close to Culebra. In June, daily temperatures in Isla de Vieques can reach 88°F, while at night they dip to 78°F. 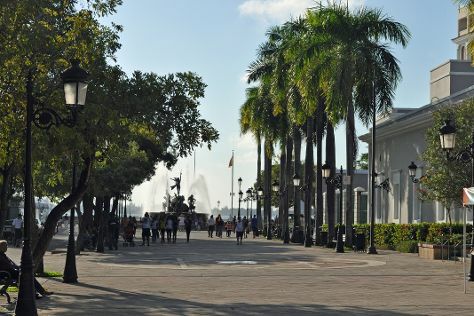 Finish up your sightseeing early on the 23rd (Fri) so you can travel to San Juan. On the 23rd (Fri), kick back and relax at Luquillo Beach, then get to know the fascinating history of Paseo de la Princesa, and then get engrossed in the history at Cathedral of San Juan Bautista. To see reviews, other places to visit, and more tourist information, use the San Juan trip builder. San Juan is very close to Isla de Vieques. June in San Juan sees daily highs of 90°F and lows of 78°F at night. Wrap up your sightseeing by early afternoon on the 24th (Sat) to allow enough time to travel back home.